The battle of Montaperti, which was fought around 750 years ago at Montaperti, near Sienna, was one of the most famous battles in the long struggle for supremacy between between Sienna and Florence. Dante, in the Divine Comedy, describes the battle of Montaperti as “The havoc and the great slaughter, which dyed the Arbia red”. It was the bloodiest defeat suffered by the Florentines in their centuries long war against Sienna. Celebrated by the Siennese as the worst humiliation inflicted upon Florence, at that time one of the richest and most powerful cities in Italy, today it is no longer considered by historians a true battle, but rather an ambush on the Florentine army marching towards Montalcino. 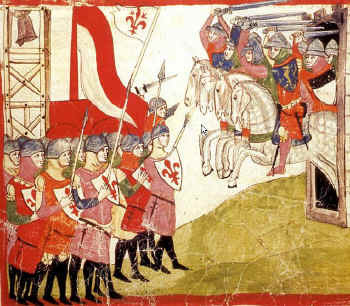 After an initial victory in the spring of 1260 over the German knights in the service of Sienna, the Florentines planned an expedition to help Montalcino with troops and provisions. The town was being besieged by Sienna because of its strategic position, controlling the via Francigena. All men between the ages of 15 and 70 from the Florence and from the countryside, were summoned to arms. These men, together with militias sent by the allied cities of Prato, Volterra, Colle di Val d'Elsa, San Gimignano and Bologna, formed an army of 30,000. Each “popolo”, the territory belonging to a church, had to give the army a quantity of grain in proportion to its population and to the area’s production. The Road Archives of the Florentine army, a document unique of its kind, is a direct report of what happened in August 1260. The documents, drawn up by the army’s one hundred notaries who punctually recorded all events, are collected in the “Libro di Montaperti“, which is kept in the Florence State Archives. The soldiers’ journey passed through the whole of Chianti. The army set off from Florence on the 21 or 22 August through Porta Romana, passing Galluzzo and Tavarnuzze. After Montebuoni it crossed the river Greve over a precarious bridge, probably made of wood. After passing the town of Sant’Andrea in Percussina, it stopped in San Casciano, where it found new conscripts and provisions. From here, following the course of the Pesa, which it crossed at Sambuca, the army reached the second stop, San Donato in Poggio, where it set up camp. On 29 August the soldiers were at Ricavo, less than a day’s walk from San Donato, and then reached Fonterutoli, where they set up camp in a place then called Monsanese, along the road to Vagliagli. Instead of heading towards Sienna, the Florentine militias moved towards Pievasciata. From here a diplomatic mission was sent to intimidate the Siennese into unconditional surrender. According to Siennese historians, the terms were so humiliating as to be unacceptable. Once the news of the mission’s failure came back, the army set off again towards Montalcino, passing by Pianella. On 4 September at Montaperti, the Florentine army was probably preparing to set up camp when the enemy sprang its surprise attack. The Siennese, who were far fewer in number, gathered their army at Porta San Viene, today’s Porta Pispini, and sent out the German knights of Manfred of Swabia, King of Sicily. These experienced mercenaries, who had been promised double pay in the case of victory, attacked the Florentines both from the vanguard and the left flank. The huge army hardly had time to react. The rudimentary arms of their foot-soldiers - pitchforks, hatchets and axes - and the bulk of the supplies they were carrying to Montalcino fatally hindered their manoeuvres. Giovanni Villani, the 14 C historian, records in his Chronicles that Florentine casualties were more than 2500 and the prisoners more than 1500. Victory was short-lived. Nine years later, the Tuscan Ghibellines were defeated by Charles of Anjou and, for almost a century, Sienna was obliged to toe the Florentine line. Sienna reached its peak under the republican rule of the Consiglio dei Nove (Council of Nine), an elected executive committee dominated by the rising mercantile class. Many of the finest buildings in the Siennese Gothic style were constructed during this period, including the cathedral, the Palazzo Comunale and the Piazza del Campo. The Siennese school of painting was born at this time, with Guido da Siena, and flowered in the early 14 C, when artists such as Duccio di Buoninsegna and Ambrogio Lorenzetti were at work. A plague outbreak in 1348 killed two-thirds of the the city’s 100,000 inhabitants and led to a period of decline (even today the city still has a population of just 53,900). At the end of the 14 C, Sienna came under the control of Milan’s Visconti family, followed in the next century by the autocratic patrician Pandolfo Petrucci. Under Petrucci the city’s fortunes improved, until the Holy Roman Emperor Charles V conquered it in 1555 after a two-year siege that left thousands dead. He handed the city over to Cosimo I de’ Medici, who barred the residents from operating banks, thus severely curtailing Sienna’s power. Sienna’s centuries-long economic downturn in the wake of the Medici takeover was a blessing that resulted in the city’s present-day attractiveness. Its predominantly Gothic architecture has survived largely intact as no one could be bothered to undertake (or fund) demolition or new construction. Furthermore, unlike the battering endured by neighboring cities in WWII, the French took Sienna virtually unopposed, sparing it discernible damage. Sienna Italy Copyright © ammonet InfoTech 2009 - 2015. All rights reserved.